There's about a million or so iconic characters in the Star Wars universe. It'd be really hard to stat out all of them on your own if you're running a Star Wars game. That's where Fantasy Flight is ready to step in and help. They've announced the Allies and Adversaries book. It contains over 130 new NPCs from all the different factions and time periods in the Star Wars saga. Fantasy Flight is headed to the realm of the Prequels with their next rounds of Star Wars releases. We've seen it for X-Wing. Now we're seeing it for the RPG. Rise of the Separatists is the book, and in this preview, we get a look at some of the iconic arms and armaments that will be in its pages. Espionage is a major part of any conflict. Getting information on enemy numbers, movements, plans, and planting false information, along with carrying out covert, strategic strikes on enemy installations can easily lead to victory in an overall conflict. And when you're outnumbered and outgunned, it matters even more. Well, the Rebel Alliance is outnumbered and outgunned, so they require their spies to go above and beyond. 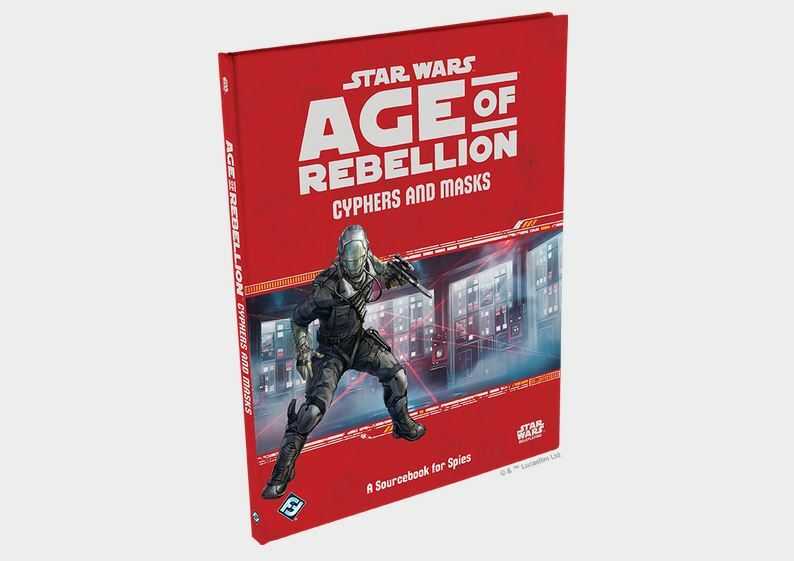 If you'd like to play a character like that in the Star Wars RPG, you'll want to pick up the Cyphers and Masks book, along with the Signature Abilities Decks. All of them are available now. The Star Wars saga is broken up into various distinct time periods. You've got the Old Republic. You've got the Empire. You've got the New Republic. And so forth and so on. The transition between those times is one filled with conflict. In going from the Old Republic to the Empire, you have the Clone Wars. That's where the Rise of the Separatists sourcebook will take place for the Star Wars RPG, coming soon from Fantasy Flight. When sitting around and talking no longer gets done what needs to get done, the lightsabers and blasters come out. In the Star Wars RPG, players can focus on these combat abilities, and those abilities are being further expanded and enhanced with the Knights of Fate book. Along with the book, there's new combat decks available, so you can know just what abilities and powers you have at your disposal. While The Force is an integral part of the Star Wars universe, GMs can find it difficult to integrate it into the game. Well, the Unlimited Power book that's coming out soon has a whole section devoted to doing just that. If you're wondering how you want to bring those elements in so that everyone feels included and that their characters are vital to the game, this is your resource. The Star Wars galaxy is filled with hundreds of different alien species. Each one has their own proclivities and abilities that they got from having evolved on their planet. The Star Wars RPG does its best to give you the ability to play any of those races, and each sourcebook usually has a couple you can use. In Unlimited Power, there's 3 new ones. We get a look at them here. Lots of sci-fi series have space ships. Many have futuristic weaponry of some kind. Lots have aliens. But what sets the Star Wars universe apart from most is the Force. That mystical power that Jedi and Sith can tap into is a great tool for both good and evil, depending on which side of it you're on. The upcoming Unlimited Power book for the Star Wars RPG delves deep into the Force and gives players many more options for doing things with it. I mean, it's called Star Wars, not Star Sit and Talk It Out. While the Jedi do look to try and have peaceful resolutions to problems, they also are trained warriors, ready to clash lightsabers with anyone who might do them or any other peaceful being harm. The Knights of Fate book, coming soon for the Star Wars RPG, gives players more options for combat-oriented characters. There's also 3 new races you can choose from, plus other special abilities and updates. I'm not entirely sure how you preview something that's been out for 30 years, but I guess it is getting a bit of a touch-up, and there's a huge chance that many of you weren't even alive when this book was first released. But anyway, Fantasy Flight will be releasing a 30th Anniversary Edition of West End Games' Star Wars RPG. Take a look inside of it in this preview. When Chancellor Palpatine turned into Emperor Palpatine and created the first Galactic Empire, there were many different groups that rose up against him. Sure, we know of The Rebellion, but they weren't the only ones wanting to go back to a simpler way of life. Another faction was The Broken Horn Syndicate. In the upcoming Dawn of the Rebellion book for the Star Wars RPG from Fantasy Flight, you can get some real insight into how this organization worked, and even become a member for yourself. Pre-made adventures are great for GMs with a time crunch. I'm currently using one for a game I'm running. They give the players a lot of action and adventure and the GM can still play around with it as they please. For those playing the Star Wars RPG from Fantasy Flight Games, a new adventure is now available that will take your group to the planet Dathomir, home to some Force artifacts that you're looking to get. Check out Ghosts of Dathomir now. As with just about every new Star Wars RPG book, there's lots of new options for players to create more unique and defined characters, letting them play just exactly what they want to. In Cyphers and Masks, a book all about spying and subterfuge, there's a new specialization (the Courier) and a new species (the Balosars), that we get a preview of here today. Game sourcebooks for your RPGs are all about options. They give GMs new places that they can steer the game. There's new types of gear that the PCs can get. There's new monsters the PCs can fight. There's new things that the PCs can incorporate into their characters. 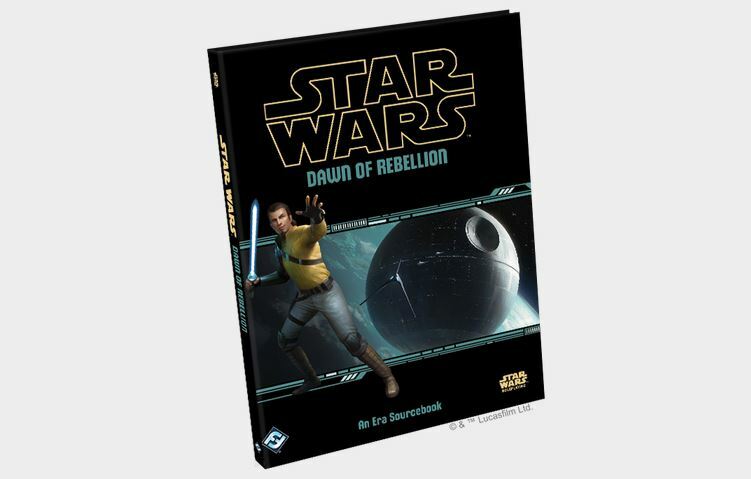 The Dawn of Rebellion sourcebook coming for the Star Wars RPG look at a new era of the Star Wars saga, taking place right between the events of the Prequels and the classic Trilogy. In this preview, get a look at some of the new options that will be made available.